In the world bond fund category, a dramatic change has happened: last year’s worst-performing funds are this year’s best-performing ones. In the world bond fund category1, a dramatic change has happened: last year’s worst-performing funds are this year’s best-performing ones. 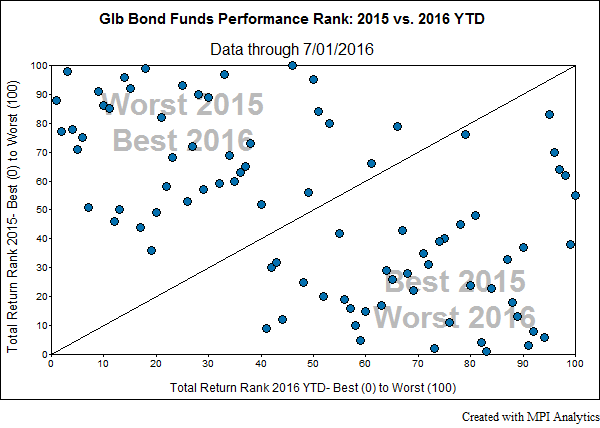 This is clear in the chart below, in which we see the performance rank of funds contrasted between 2015 and 2016. Funds below the line have decreased in rank, while funds above the line have increased. Naturally, it begs the question as to what is driving this strange movement in relative fund performances. Currency exposure could be one potential culprit: the dollar strengthened substantially in 2015, which came as a blow to managers who were receiving interest and principal payments in Euros (and who thus began to take in less dollars/Euro). In 2016, the opposite effect occurred, rewarding that same set of managers.